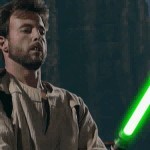 Kyle Katarn was a famous Human male Rebel operative from Sulon and later a Jedi of the New Jedi Order. He was a former Imperial stormtrooper who defected to the Rebellion. Often paired with fellow Rebel agent and smuggler Jan Ors, he performed many covert missions for the Rebel Alliance and later the New Republic, including the sabotage of the Dark Trooper Project.